The buoyant force (Fl) of the aerostatic baloon is obtained by heating air inside its cavity. The buotant force is due to the difference of density between the hot air inside and the cold air outside the balloon cavity. The buoyant force compensate the balloon weigth (w) (having into account the ballast (wl ) and people weight). The air is a perfect gas. Therefore air density can be computed with the following equation : density=P/R*M /T. Where R is the constant of ideal gases, M is the molecular weigth of the air, P is the air pressure and T the air temperature. The standard atmosphere model from the surface to 11 km altitude is used to describe the variations of the temperature and pressure with altitude. This model states that the temperature decreases 6.5 K per Km (T=T0-6.5K/Km*h(km)) and the pressure follows the following equation: P=P0*(T0/T(h))^-5.256. Where T0 and P0 are the temperature and pressure at sea level. This simulation demonstrates Archimedes' Principle with a hot air balloon. 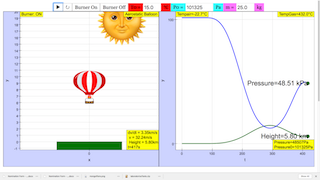 The rising and falling of the hot air balloon is affected by the ambient temperature T0, the initial air pressure P0, and the mass of the hot air balloon m.
The left graph of the simulation shows the actual hot air balloon. The right graph plots the graph of pressure (blue) and height (green) against time. Turning on the burner causes the hot air balloon to rise, turning the burner off causes it to descend.